The Sheltering Tree is the county’s only cold-weather shelter for the homeless. 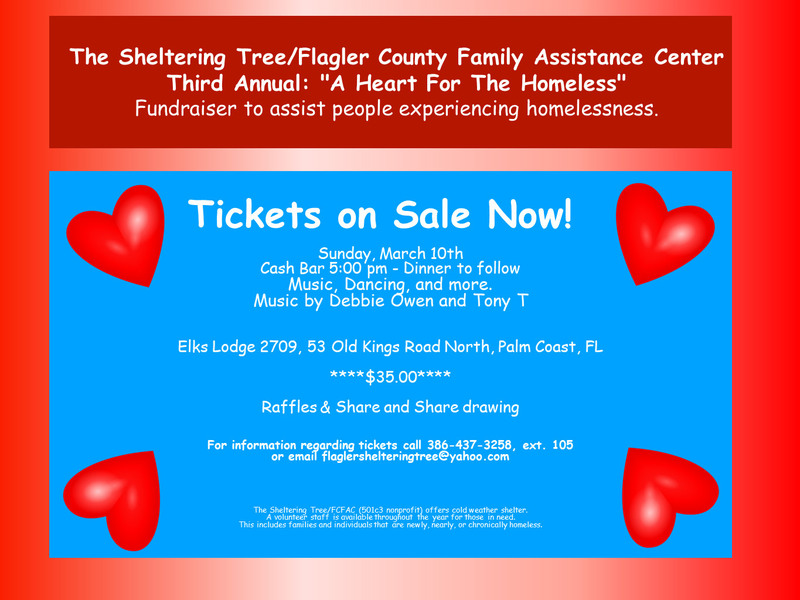 The Sheltering Tree, Flagler County’s only cold weather shelter, will hold its third annual fundraiser on Sunday, March 10. The “Have a Heart for the Homeless” dinner and dance will raise money for the shelter assisting new, near, or chronically homeless. Tickets to the event, to be held at Elks Lodge #2709 off Old Kings Road in Palm Coast, are $35 each. For reservations call the Shelter at 386-437-3258 extension 105, or email flaglershelteringtree@yahoo.com. Tickets are also available at Aimee’s Hallmark Shop at Palm Harbor Shopping Village in Palm Coast. Doors open at 5 p.m. with a sit-down dinner beginning at 6 p.m. Music and entertainment will be provided by Palm Coast headline entertainers Debbie Owen and Tony T. Raffles and door prizes. The Fundraiser will also feature success stories about the Shelter and provide critical information about the homeless in Flagler County and the challenges they face every day. Organizers are asking the community to open their hearts for the fundraiser and help support The Sheltering Tree’s vital services to people in Flagler without the resources to support even basic human needs. The Sheltering Tree has provided the homeless with food and cold weather shelter since 2008. 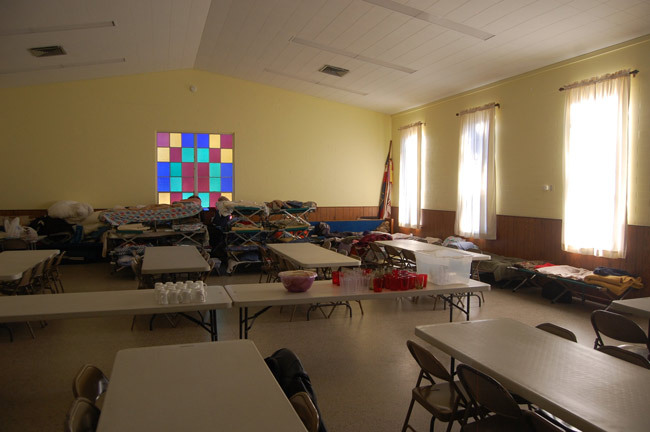 Located at Bunnell’s First United Methodist Church, the shelter is also dedicated to providing basic needs to the homeless, including food, tents, sleeping bags, and clothing, while helping them make the transition to permanent affordable housing and preventing at-risk individuals from becoming homeless. Staffed solely by volunteers, the shelter also offers transportation services and support to reunite individuals with their families. Financial donations are needed to offset the expenses to operate the shelter which include rent, insurance, food, cots, linens and towels, laundry service, and necessary toiletries for individuals and families. The Sheltering Tree is a 501c3 non-profit charity and is operated by the Flagler County Family Assistance Center. I went last year and had a blast! This is truly a grassroots program that does a lot for the unfortunate in Flagler County. Please open up your hearts and help your neighbors. My appreciation for all you do those compassionate volunteers! !